Today City Council Commission D holds synchronization meeting with five SKPDs about City Budget (APBD) 2018.
" Today we hold work meeting to monitor budget absorption in several SKPDs which are partnering with Commission D"
Those five SKPDs are Jakarta Bina Marga Dept., Environment (LH) Dept. Water Resources (SDA) Dept., Housing and Settlement (PRKP) Dept., and Forestry Dept. "Today we hold work meeting to monitor budget absorption in several SKPDs which are partnering with Commission D," stated Iman Satria, Head of City Council Commission D, Tuesday (8/7). In this meeting, he asked all SKPD heads to prioritize budget absorption that relates with public service. Such as road repair and construction. He also wants SKPD to be more selective in choosing contractor in every procurement. "Once more, I want to convey council members aspiration, particularly for prioritizing public service," he conveyed. 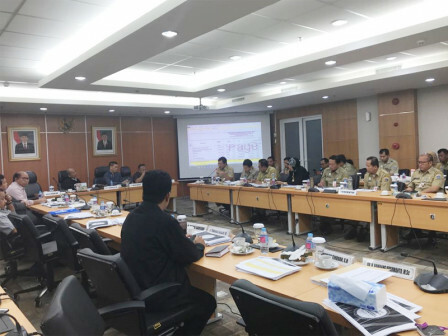 At the same location, Jakarta Secretary's Assistant for Development, Yuzmada Faisal mentioned, his side will follow up Commission D members and leader's recommendations and coordinate it with related SKPD leaders. "We will evaluate our procurement work quality. Overall we will evaluate it," he added.